I’m a big fan of Mark Lawrence‘s novels. His debut, Prince of Thorns (published in 2011) blew me away, and I blitzed through it in just two sittings. King of Thorns, the sequel, was a heftier beast, but no less good. I haven’t managed to get around to Emperor of Thorns, just yet, but I do intend to do so ASAP. He has since completed his first trilogy and begun a second, parallel trilogy set in the same world and at the same time. 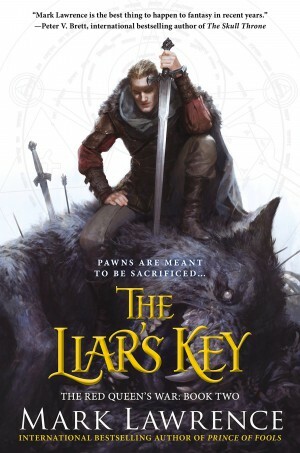 The cover for the second novel in this new trilogy, The Liar’s Key now has UK (below) and US (above) covers. After harrowing adventure and near-death, Prince Jalan Kendeth and the Viking Snorri ver Snagason find themselves in possession of Loki’s Key, an artefact capable of opening any door, and sought by the most dangerous beings in the Broken Empire — including The Dead King. The Broken Empire trilogy includes Prince of Thorns, King of Thorns and Emperor of Thorns. The Red Queen’s War trilogy includes Prince of Fools, The Liar’s Key and The Wheel of Osheim (2016). 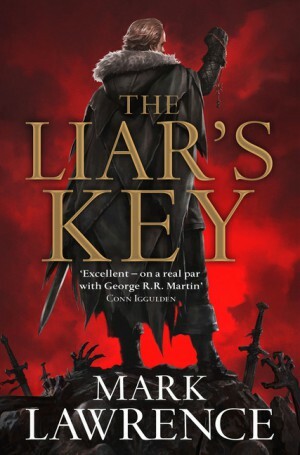 The Liar’s Key is published in the US by Ace Books, on June 2nd, 2015; and in the UK by Voyager, on June 18th, 2015.